Tensile Strength: To withstand maximum load or stress without any damage and it is measured as the ratio of maximum load to the cross sectional area of the belt. Operating Speed: The maximum working speed of the rubber V-belt. Operating Temperature: The temperature range at which the belt is designed to operate properly without any damage. Material of Construction: This is to select the type of rubber required to produce the belts. Length: The cross sectional length of the top flat portion of the V-belt. 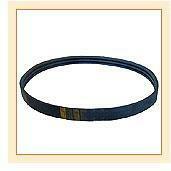 Width: It is the overall width of the V-belt. The effective width should be considered while selecting the belt for a specific drive mechanism. Raw Edged V-Belts: They are used when there is the chance of constant slippage of the other V-belts. Narrow V-Belts: They have a narrower pitch width when they are compared to the other types of V-belts. Ribbed V-Belts: These belts consist of two or more V-like formations which are placed next to one another and the cross sectional picture looks rather like a multiple W-Belt. Classic V-Belts: It is a single V shaped belt without any ribs or raw edges.